Good evening and welcome to Yarn and Hooks. Today I will be teaching you one more useful and important crochet technique that will make your crocheting time much more enjoyable and entertaining. This is a step by step tutorial on how to crochet an invisible join for tapestry crochet. 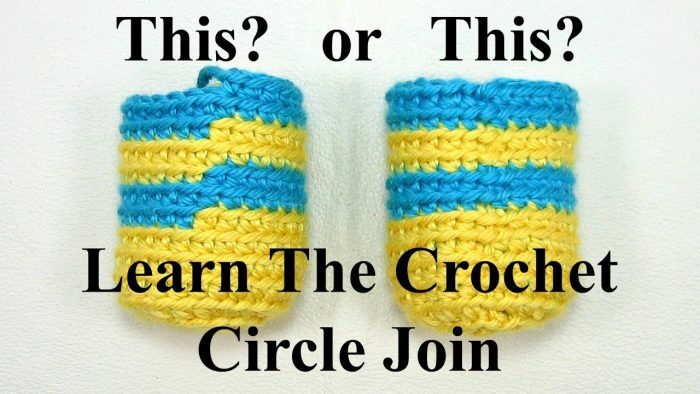 The crochet circle join also called the invisible join is used to close the gap between rows when crocheting in the round. It makes for a more delicate look when doing Amigurumi, Tapestry Crochet design work, creating colourwork designs on socks, hats or anything that you create in the round. We have already mastered some extremely useful crochet tips and tricks like How To Crochet The Perfect Stripes or how to Crochet Two Rows At The Same Time and judging by your responses, you found it quite helpful. So today, we are going to move on and bring you some very easy to follow crochet tutorials that minutely explain each and every step of working up an invisible join. Here is a step by step video tutorial on how to crochet the circle join or an invisible join in the easiest possible way. Just follow these easy instructions and improve your crochet skills. Good luck. Hope you’ve enjoyed this quick and useful video tutorial on how to crochet an invisible join for tapestry crochet. If you liked it please follow us on Pinterest for more beautiful patterns and tutorials. Good luck and happy crocheting!